With the presence of flammable gases and vapors, hazardous locations around the world demand electrical products engineered to provide proper protection from dangers like heat or spark-induced ignition. Our engineers have developed innovative advancements in supplying power and data throughout a facility. The Appleton PlexPower Fiber Panel by Emerson combines power and data into a single enclosure for the harsh industrial and hazardous markets. Building upon the success of PlexPower panelboards, this solution marries PlexPower circuit breaker modules and a fiber patch panel together in one lightweight, stainless steel enclosure. Our PlexPower fiber panels bring hybrid cables (power/fiber together in one cable) from up to 24 field junction boxes back to one enclosure located in the hazardous area, drastically reducing the number of long dedicated cable runs while also limiting potential failure points. 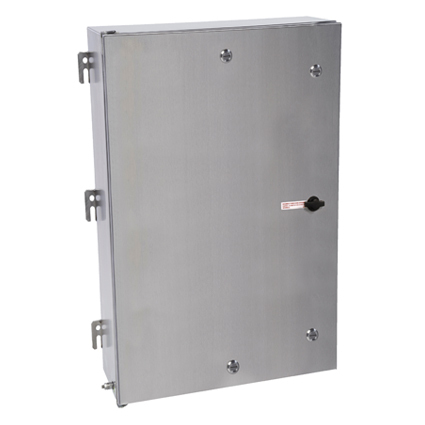 Field junction boxes can also be connected to multiple PlexPower fiber panels, creating redundant pathways to increase reliability. With an overall decreased total cost of ownership, the PlexPower Fiber Panel saves time, material, and labor. Boasting Class I, Zone 1 IIB+H2, and Class 1, Division 2 Groups B, C, D certifications (NEC/CEC) — in addition to a Type 4X rating — this solution also delivers off-the-shelf replaceable components and quick access quarter-turn latches. Additionally, it provides multiple design options, giving end users flexibility and convenience in configurations, with a smaller, lightweight footprint. Compatible with Emerson's existing PlexPower platform, the Appleton PlexPower Fiber Patch Panel can be added to or upgraded — an easy to install, operate, and maintain solution for hazardous, wet, and corrosive environments. The Appleton Code•Master Jr. LED Luminaires by Emerson, delivers exception performance for hazardous Class I, Division 1 environments. Suitable for new construction and retrofit installations, this Series uses the same mounting hoods as legacy Code•Master incandescent and less than 150 W HID luminaires, providing quick and easy upgrades to LED lighting. Equipment and plugs used in hazardous and industrial locations are often left outdoors, being subjected to wet, damp, and corrosive conditions. The Appleton™ U-Line™ Interchanger 15 and 20 Amp Plugs by Emerson™ deliver power to portable and permanent equipment and have a NEMA Type 4 watertight certification rating when unmated. Building on the technology of Appleton™ PlexPower™ Panelboards, Emerson now offers component level protection for off-the-shelf motor starters. Delivering Class I, Division 2, Groups B, C and D NEC and CEC certifications in a Type 4X rated enclosure, PlexPower™ Motor Starters provide superior electrical apparatus protection, control and convenience, in hazardous, wet, and corrosive environments. The Appleton™ Code•Master™ LED is certified for Class I, Division 1 locations and offers a full range of lumen outputs and mounting options. Easy to install in new and retrofit applications; it fits legacy Code●Master™ mounting hoods with no rewiring. Easy to maintain with field replaceable components and 60,000+ hours of operation.